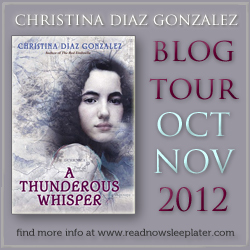 Today’s spotlight is on: Christina Diaz Gonzalez, author of THE RED UMBRELLA and the recently released A THUNDEROUS WHISPER. I’m excited to say that I’m part of the novel’s blog tour! Christina Diaz Gonzalez was also kind enough to answer a few questions below about her new book and her writing process, among other things. Enjoy! A daughter of Cuban parents, Christina Diaz Gonzalez studied accounting at the University of Miami and law at Florida State University College of Law. After practicing law for several years, she realized her passion was writing. She is the author of the award-winning and best-selling children’s novel, THE RED UMBRELLA. Ms. Gonzalez’s debut novel (the story of a 14-year-old Cuban girl who is sent to the U.S. in 1961 as part of Operation Pedro Pan) showcases the generosity of the American spirit and highlights the pain of losing one’s homeland. Reviewers from publications such as The Washington Post, Publisher’s Weekly and School Library Journal have praised the book as being exceptional, compelling and inspirational. Her second novel, A THUNDEROUS WHISPER, was just released. DESCRIPTION FROM THE BOOK JACKET: Ani is just an insignificant whisper of a girl in a loud world. At least that’s what her mother tells her. Her father made her feel important, but he’s off fighting in Spain’s Civil War, and his voice in her head is fading. Then Ani meets Mathias. His family recently moved to Guernica, and he’s as far from a whisper as a boy can be. Ani thinks Mathias is like lightning. And his father is part of a spy network. Soon Ani finds herself helping Mathias deliver messages to other family members of the underground resistance. For the first time, she’s actually making a difference in the world. But then her world explodes. The sleepy little market town of Guernica is bombed by Nazi airplanes. In one afternoon, Ani loses everything. But in helping the other survivors, Ani gains a sense of her own strength. And she and Mathias make plans to fight back in their own unique way. Q: In teacher training, I learned “you can’t cover everything” in a novel. I’d have to let the novel reveal the few most important things that should be explored in-depth in class. Pretend you are a teacher about to start A THUNDEROUS WHISPER with her class. What are the few important things you would be compelled to explore? Gonzalez: As a teacher, I would love to have the class compare and contrast the characters of Ani and Mathias. See how each character evolves and discuss what experiences (prior to meeting each other) could have led them to be similar and/or different? Finally, at the end of the novel, I’d like students to think about themselves and whether they see themselves more like Ani (thunder) or Mathias (lightning). Q: As a writer, I’m always interested to hear about how other writers attack a project. Can you talk about your process? Do you do the bulk of your research first, or do you draft and research at the same time? How long does a novel take you, usually, from start to finish? Favorite writing spots or rituals? Anything you would like to share. Gonzalez: I do the bulk of my research at the beginning and then return to the research process only to add extra layers or to clear up questions that have been raised during the writing process. I love to write at a local Starbucks with another author friend of mine (it’s like having a gym partner because even when you feel like playing hookie, you still have to show up because someone is waiting for you — it’s great for keeping you on track). While at Starbucks, I have my favorite writing chair and I’m always ordering a hot chocolate– even in the middle of summer! Q: You have written two historical novels. Do you think you will continue in this genre, or do you plan to try other areas, such as contemporary? Gonzalez: I definitely plan on writing some contemporary and possibly some science fiction/fantasy. Q: Along the same lines, you have written about historical moments in Cuba and Spain. There has been a lot of commentary about diversity in MG and YA literature (the lack of, the need for). Do you think you will continue to write about Latin issues? If so, why is this important to you? Gonzalez: I write about stories/characters that capture my imagination … regardless of what race or ethnicity is involved. However, I definitely see a need for diversity in MG/YA fiction and would love to continue to write about strong Latin characters. Children of all races/ethnicities should be able to see characters like themselves in the stories they read! MY TWO CENTS: Often, I’ll read historical fiction with some knowledge of the era or event, but in this case, I didn’t know anything about the bombing of Guernica during the Spanish Civil War and what happened to the thousands of orphaned children after the attack. How wonderful to have learned some history while reading about Ani and Mathias, two easily likable characters who are loners for different reasons. Mathias’s family often moves, and Ani is teased for being the sardine seller’s daughter. They become fast friends who share joyous moments and unbelievable heartache. One criticism I have is about Ani’s response to her mother’s abuse. Her character wasn’t one to fight back, and the story wasn’t about abuse, but I felt her overall reaction was too tame and matter-of-fact. Overall, though, A THUNDEROUS WHISPER is an easy, interesting read that could easily fit into middle school history or language arts classrooms. TEACHING TIPS: Gonzalez offers some teaching tips in the Q&A above. In addition, the novel is a good fit for a history-language arts interdisciplinary unit about Spain and the early days of World War II. Mathias plans to return to Germany, and he mentions the anti-Jewish laws already in place. If students were to study WWII after reading this novel, the teacher could always have them predict what would be happening to Mathias. The character development of both Ani and Mathias are worth pursuing, as well as the themes of the cost of war, starting over, and finding one’s purpose. Find A THUNDEROUS WHISPER on Amazon.com, Barnes and Noble.com, IndieBound.org, and Goodreads.